Sad to say that the holidays are over but that also means that the CS:GO competitive scene is back on. This will be the first big tournament for 2016 followed up by Global Esports Cup and it would be exciting to see what the players have been doing during the holidays. Most of the teams have played less than 10 games during the span of December – January and we would see which team could shake off the rust and start the year right. Natus Vincere vs Luminosity Gaming – Natus Vincere have been dominating the event so far with no close contest with their victories leading to the finals. 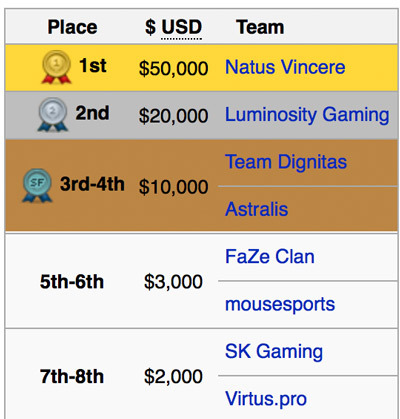 You could argue that they haven’t faced Astralis or Luminosity yet to see how they would do against the other favorites to win this event. I do now believe on how Luminosity Gaming’s work ethic and their bootcamping before this event shaped them to become one of the best teams in the world and currently the best team in NA. They have been practicing non-stop and even thinking of strategies while on the plane and now it's paying dividends. I wouldn’t want to underestimate Na’Vi but the odds would probably go 50-50 considering how both teams have dominated the competition recently. FaZe defeated LG on the first game of DH and for me, it was just an overall bad performance by LG to say the least. They even almost lost a close one against SK to stay in the tournament, besting them 2-1 in the series. Na’Vi toyed with this SK team and won a round where they went for a 4 AWP set up. LG was suppose to be on par with Na’Vi and they haven’t been really showing up. Na’Vi is looking really good this tournament and are clear favorites to win the tournament. They made FaZe look like a tier 2 team and taking rounds with a serious disadvantage throughout the game. So basically, it’s more of a great performance by Na’Vi rather than a no showing by FaZe. LG still has the firepower and talent to pick themselves up but with odds favoring them it would be wise to skip or play the odds. NiKo went full beast mode on their OT loss to Astralis. He almost singlehandedly clear every A site take as a T from palace in mirage. Mouz had the game so many times losing 3v5 rounds against the T on clutch situations near the end of the game. ChrisJ whiffed a few aggressive awp plays that he should be clearly getting on those particular situations. Spidi also missed a crucial counter frag in the end and Astralis was able to force OT and take the game. For dignitas however, I wasn’t able to watch their match against VP but it looks like they were able to take the series in a close game 3 OT win against them. VP as predicted would look really bad as I suggested a skip or play the odds if it gets too one sided. They only had 1 game played together before DreamHack Leipzig and were clearly showing off the rust by getting dismantled by mousesports. Natus Vincere vs SK Gaming – Na’Vi could be considered as a top 3 team and obviously they would be heavily favorites to win this one. SK Gaming however, have somewhat stringed some good performances recently and if you have watched fnatic enter the csgo scene, you most probably know MODDII and most of the danish squad play. They have experience and could definitely produce an upset. Luminosity Gaming vs FaZe – Luminosity is slowly emerging as a team to be reckon with. They were dismantling teams even with players like TACO not performing well. FalleN is becoming a force with the awp lately and it’s safe to say that they would be on-form for this international LAN event. On the other hand, FaZe has just acquired the old G2.Esports squad even with the disappointing performances against FlipSid3 and a string of losses against Na’Vi and fnatic. It would be exciting to see how they would perform with this new organization. jkaem would be doing a lot of carrying for them to take this one. Astralis vs dignitas – I am having this extreme gut feel that Astralis would be taking this one easy. If you still haven’t heard, they are ex-TSM or ex-”?” with a new player owned organization. 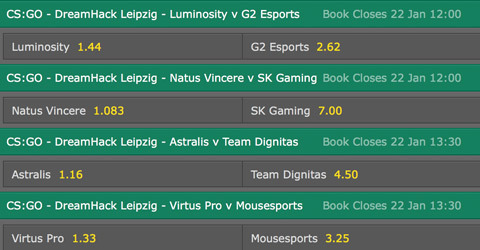 dignitas have been performing well but these games they were able to pull were against low tier teams. Even with Astralis losing three straight games and getting kicked off StarLadder, we can’t consider them as off-form since fnatic and Na’Vi were red hot when they beat them. Virtus.pro vs mousesports – VP haven’t played much cs lately with only 1 game played within a two months span. They are a strong team nonetheless so you would be a fool to bet on this game on either team.